Rhoelyn: Rhese presses his back against the cliff, hidden in the shadows. The voices at the campfire are too soft to make out, so he inches closer. 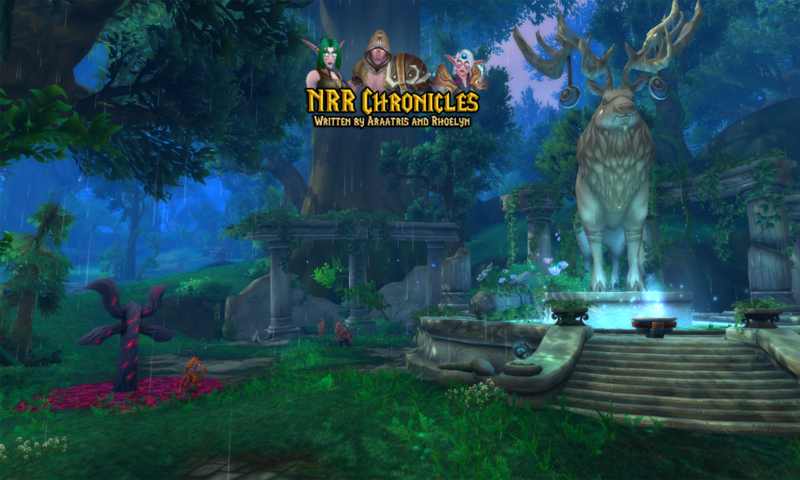 Araatris: “…oing to ensure the route is clear around that camp?” The man who speaks, one of the horned and blue-skinned draenei, frowns at his companion. Araatris: “Why did you not say something sooner?” The draenei hefts his sword and shield and stalks off, leaving her chuckling softly to herself. Araatris: His frown deepens, and he mentally curses. Rather than give everything away, he lets his sin’dorei form slip before he steps out from the shadows. Rhoelyn: Aleesa smiles serenely at him. “Come. I’ve been expecting you. The winds tell me that you need something.” She pats her log and scoots over. Rhoelyn: “I’m a shaman if it eases your mind, but you came here for a reason. What do you plan to accomplish?” She waves and encourages the dwindling fire. Araatris: He shudders, glaring at them, but he clenches his fists and forces himself still. Blood drips from his nose and split lip. He growls more quietly. Araatris: Rhese sprints away, shifting to the fleet cat as he rushes off into the deepening night. Elsewhere, Nysse stirs as a cloth is pressed to her head. Araatris: “So you do have a master.” The sin’dorei lights another candle with the low one, and she gets a look at his short, auburn hair and kind smile. Rhoelyn: Nysse bites her lip and nods. “I’m sorry, but I don’t understand. Where am I? W-who are you?” She grimaces as pain shoots through her mind. Rhoelyn: She gives a nervous little shake of her head. “In the w-water. I didn’t see anyone.” She shifts to the far side of the bed and tries to stand. Araatris: “Wait.” He stands quickly, managing to move around fast enough that he’s prepared when her knees give out under a blinding stab from her head. Rhoelyn: Nysse blushes furiously as he swings her back onto the bed. “W-why does my head hurt?” Relare settles her gently, retrieving the damp cloth. Araatris: The blood elf smirks, an expression like his brother’s, and turns away to retrieve a platter still half full of meat and cheese and bread. Rhoelyn: Nysse blinks in confusion and blurts out. “Y-you don’t? I thought all sin’dorei…” She clamps her hand over her mouth and grimaces in pain. Rhoelyn: Nysse takes the plate and rests it in her lap. “It’s fine. T-thank you.” She nibbles at first before hunger overrides her initial caution. Araatris: “Think nothing of it.” The paladin settles back and watches her eat for a moment before dragging some papers from the desk nearby to look through. Araatris: Relare shakes his head. “I’m just glad you weren’t harmed. You have no memory of who or what attacked you?” At her frowning no, he folds his arms. Araatris: The mage steps up as Relare opens the door. “I’ve had a frantic late-night visitor. Rhese is mi–” His glance goes to Nysse, and his eyes widen. Araatris: His expression somewhere between thunderous and wounded, the black-haired sin’dorei shoves past the brothers and crouches, grabbing her shoulders. Araatris: “A-attacked? !” His grip on her arms tightens, and he snarls, “Who? Relare?! Is that how you ended up in his bed?” He turns with a glare. Rhoelyn: She shakes her head panickedly. “N-no! Something else. Relare found me unconscious. H-he didn’t know who my m-master was…” Tears well in her eyes. Araatris: The disguised druid turns back to her and blinks, trying to process her words through his worried anger. For his part, Relare looks amused. Araatris: He quiets, brushing his thumb along her cheek to sweep away some tears. Rhese opens his mouth to say something, but stops and pulls her up. Araatris: “Let her rest for now, Riverwind,” the commander orders, gesturing back to the bed. As Rhese reluctantly obeys, Relare addresses Nysse. Araatris: “You said something similar, earlier. Can you elucidate? What might be … missing? Or forgotten?” Rhese and Leo watch her as well. Araatris: The disguised druid pauses just long enough to thank the brothers before he carries Nysse through camp. She is grateful for the late hour. Rhoelyn: Rhese shoulders through the tent flap and settles Nyssera onto a large cot on one side of the tent. He sits on the edge and rubs his face. Rhoelyn: Nysse pushes up and grips his arm. “I can tell, and I’m sorry. Do you want to talk about it?” She leans toward him with a long, relieved sigh. Rhoelyn: She nods against his shoulder, pulling away to lay down. Rhese tugs the light cover over her. When he moves to stand, she grasps his shirt hem. Araatris: The druid sinks back down, resting on his knees beside the cot. “What? I told you I wouldn’t leave you alone, Nysse.” He brushes her hair back. Araatris: “Next to…” Rhese blinks at her. “I… yes, okay. Scoot over.” If his cheeks darken, it’s only slightly. He kicks off his boots and unlaces his armor. Rhoelyn: It’s not long before her breathing evens behind him. It takes him much longer to fall asleep. It’s much too soon when light peeks in under the tent. Araatris: The druid awakens with a start, shifting to his sin’dorei form before he’s even fully awake. He pushes to his elbow and looks around in confusion. Araatris: “Co-” When his voice doesn’t have the right roll, he coughs and clears his throat. “Come in.” Rhese swings up and tucks the covers around Nysse. Araatris: Rhese scrubs his hands over his face and then brushes them through his dark hair. “Excellent. I’ll see that she eats.” He scrabbles for his armor. Araatris: Glancing back at Nysse, the druid nods and works on lacing up his dark cuirass. “She was attacked, b-” “Surfal, c’back to bed,” she slurs. Rhoelyn: Gathering her wits, Faye nods. “Come find me if either of you need food or anything.” The cook grins slightly, but quickly leaves them alone. Araatris: The druid flicks Nysse some sort of look that’s between amused and irritated before shoving himself up from the cot. He grabs a bowl of breakfast. Araatris: He’s left gaping for a few seconds too long, and she finishes her stretch, glancing over. Rhese starts to say something and then chokes, coughing. Rhoelyn: Nysse quickly sits up, frowning worriedly. “Are you okay? Did your food go down wrong?” She pushes to her feet and strides to his side. Araatris: The druid retreats to the tent flap before hastily mumbling, “Your b-bodice,” and rushing outside, flopping the opening closed behind him. Rhoelyn: Rhese turns to Leothir. “It was a long night, but I think Nyssera’s doing better this morning.” He gestures for the other elf to join him. Araatris: The mage releases him to walk beside. “Careful, Rhese. One might think you were fond of your cute little slave.” His grin says it’s not a bad thing. Rhoelyn: Rhese snorts. “There’s a difference catching them off guard and going in unprepared.” They wave to the guard and head into the command center. Araatris: At Relare’s office, the sergeant on guard bars the way and asks them to wait. Muffled voices are clear through the wooden portal. Rhoelyn: “…is done. We need to complete this item next. Have they already gone out?” “Yes, sir.” “Good, good.” Rhese leans against the wall to wait. Araatris: The spy feigns boredom, half listening as Leothir chats at him about some city in Tirisfal. His real attention is on the other conversation. Rhoelyn: “One last thing. Send a message to Bahr. Tell him the ghosts of the past still whisper. He’ll know what it means.” Relare orders as he closes up. Rhoelyn: Leothir smirks. “Good morning, Deth! I see Relare has you working early today, try not to let him work you to the bone.” Rhese nods to him. Rhoelyn: The guard ushers them in. Relare spreads papers out on a large table. “Oh good, Leo. You have the reports I need.” He holds out his hand. Araatris: The commander’s brow quirks up at his brother. “Oh, is that the story you’re telling yourself this week, Leo?” The mage frowns and blushes. Rhoelyn: “He was mentioning some sort of delicate flower or something in contrast to my wildling. Is it the same one?” Rhese lips curl in amusement. Araatris: “Yes,” the mage admits. “I can’t imagine letting her be subjected to the war.” Though his brother frowns, this time he holds his tongue. Araatris: That has Rhese blinking. “Love… Nyssera? Of course I don’t.” Both brothers smirk at him, matching expressions. “Certainly not,” Relare deadpans. Araatris: “Mmhm,” the commander says, already half distracted. “I’ll send for you when I have more for either of you.” The two make their way outside. Araatris: Scoffing, the druid says, “I’m not the one who was clingy. The girl barely let me sleep, draping all over me all n-” At Leo’s look, he pauses. Rhoelyn: Vorok growls again. “Let’s see what you have there. What a fine looking pup. May I see?” The wolf stares, then huffs and lays down his head. Araatris: Leothir and the human watch with concern as Rhese brushes a hand down Vorok’s side to the pup. He looks to be a few months old. Rhoelyn: The large wolf leans in causing the others to hold their breath as he bears his teeth. Rhese pauses as Vorok licks the pup, waking it with a yip. Rhoelyn: “Yeah, I’ve got some scraps to spare.” He ducks out of sight and returns with a platter. Rhese takes the plate and sets it in front of the pup. Araatris: Oddly, he sniffs curiously at the food as if uncertain what to do with it. When he looks up at Vorok with his dark eyes, the other wolf wuffs. Rhoelyn: After a few minutes, the pup is grabbing Rhese’s hand. He grins. “Come on. Let’s take you to Nysse.” Rhese scoops up the pup and stands. Rhoelyn: Nolin grins as the coins are handed over. “‘Course, sir. Little guy is welcome anytime.” Rhese and Leo walk through the camp to his tent. Araatris: The druid quietly fishes out his timepiece and grimaces, turning to his companion. “It… was a long night, and Nysse is likely resting…” He stares. Rhoelyn: Rhese blinks and follows Leothir’s gaze to the tent. “What? Something wrong?” The mage shakes his head. “What? Oh no, not at all.” He grins. Araatris: The black-haired sin’dorei hesitates. “Did… you want to come in?” Leo chuckles and shakes his head. “Not on your life.” He grimaces and hurries off. Rhoelyn: Rhese watches in confusion before heading to the tent and pushing inside. “Nysser-” He cuts off at the sight of washed clothing on a chair. Araatris: His glance slips over to the bed before he can stop it. Sucking in a breath, the druid nearly backs out of the tent before he considers their guise. Araatris: “Y-” The druid coughs, realizing he’s still staring. He quickly turns away, blushing to the tips of his ears. “You’re naked,” he blurts out. Araatris: When he has braced himself enough to turn, the druid avoids looking at her. “I need to sit. Have a puppy.” He shoves the pup at her as he passes. Rhoelyn: Nysse looks up at Rhese. “Why don’t you take the cot and rest.” She yawns. “I’ll sleep on the ground.” The wolf pup yawns and snuggles in her hands. Araatris: Rhese nods and yawns. “Just give me an hour, then you can rest. I’ll be better, then.” The pup wakes enough to squirm around and lick her face. Rhoelyn: The huntress giggles and tickles his belly. “Sleep as long as you need. I’ll think of a name for this little one.” Rhese pulls off his boots. Rhoelyn: She clears her throat. “I… can’t go out until my clothes dry. I don’t have my collar or chain…” Her cheeks are pink as she plays with the pup. Araatris: The huntress brushes the pup’s fur and snuggles him when he starts to get drowsy again. Behind her, Rhese sleeps, his breathing the only sound.